2) Those who have family or friends who were a part of that school, and for whom victory creates conflicted feelings; knowing that happiness came at the expense and misery of those aforementioned people held dear. I am amongst the conflicted. I was always jealous of those who held an unbridled hatred of the Beavers, it was such a direct mindset, one I never had the luxury of experiencing. My parents both went there, they even met at a football game. My brother is currently enrolled there, as were a fair number of my friends and family. Don’t let my sympathies confuse where my loyalties lie; at this point rooting for the Ducks is a completely reflexive process. Yet whenever a Civil War ended, after the celebration had ceased, it was hard not to feel a tiny measure of guilt at knowing that those whom you cared about being on the losing side. Then came last Saturday night. A few short minutes after Oregon’s heartbreaking loss to Stanford, Reser Stadium erupted louder than it would the rest of the night at the stadium’s announcement that the Ducks had lost. 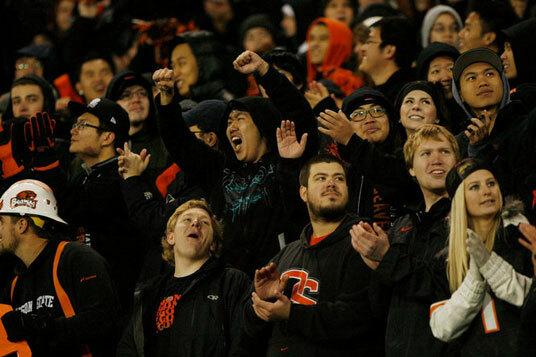 With that reaction, all feelings of guilt about beating the Beavers were forever extinguished. Even though I chose to go to a different school, my dad and I had always found common ground in the same philosophy, though we chose different teams through which to believe it. We understood that parity was when sports are at their greatest – when all teams have a fair shot at winning. It is a structure and philosophy is overtly evident in only one sport in America, the one that is also its most popular: the NFL. College football once exceeded pro football in popularity. Today, that popularity is inverted, despite college football being a more entertaining product. It would not be unreasonable to assume that the loss in market share could be attributed, in no small part, to an existing system designed to sustain the sport’s plutocrats. The game is rigged; changes are made at a glacial pace, and progress hindered under the guise of “tradition”. The entire power structure – the bowls, the conferences, the media – are in place to make sure the rich stay richer. When Oregon was ranked #1 for the first time in school history in 2010, it was the first time in twenty years any college had a debut week at #1, and only the eighth time a school had done so in the last fifty years. It is an establishment that does not like letting new members into the club. Until last Saturday, this was going to be a red-letter year for college football’s proletariat. Oregon and Kansas State, two programs who had matching 2-9 seasons only 30 years ago, were on the verge of meeting for the BCS Championship, while the most relevant program in college football history, Notre Dame, would have been left out even if undefeated. Of the 28 participants in the BCS Championship game, only two (Virginia Tech 1999, Oregon 2010) didn’t already possess a national championship coming into that game. An Oregon-Kansas State matchup would have doubled that number. Prior to Oregon State’s game against Stanford two weeks ago, it was looking to be a strong year for the state of Oregon. A dream scenario was emerging for me, not only with Oregon going to the National Championship, but also for my terrible sympathizing guilt; Oregon State could get to the Rose Bowl without having to defeat Oregon, a near-impossibility in any other year. It was becoming the state’s strongest year since 2000, the parallels of which were terrifying. 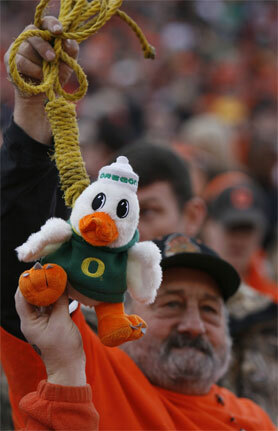 That year, Oregon State also had a three-point loss at Washington, and hosted the only matchup between two top-10 teams (where Oregon State would have been ranked with a single loss) in the rivalry’s history; a game Duck fans would like to forget. But the Beavers went to Palo Alto, and their dream season was lost. Fast forward to just after 8:30 last Saturday evening, when the announcement of Oregon’s loss caused Reser Stadium to erupt; far louder than the Brandin Cooks touchdown scored moments later. The loudest cheers that night came not from something the Beavers did, but at something the Ducks didn’t do. It would be understandable to cheer for your rival’s downfall against a lesser team, but why would Beaver fans root for Stanford, a team that had knocked them out of as many Rose Bowls (2008, 2012) as Oregon (2008, 2009) had? Under what mindset is it better for Alabama and Notre Dame to play for the title instead? Pair that with the reaction that Oregon fans had earlier this season, when Oregon State’s victory over Wisconsin was announced. Fans cheered. Oregon fans had no alterior motive for their celebration, no axe to grind against Wisconsin, whom they had triumphed over in January. Instead, it was about wanting to play the best Oregon State team possible, or least one that was highly ranked. 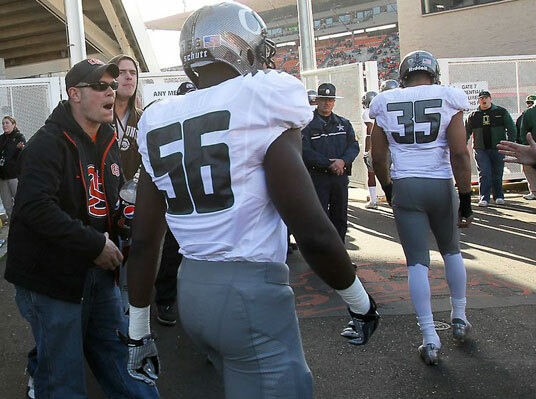 These examples illustrate the fundamental difference between the agendas of Oregon vs. Oregon State. Oregon fans want Oregon State to be good (just not better than the Ducks), if only to enhance the value of any victory over them. Oregon State fans want nothing more than to see the Ducks lose, even at the expense of their own success – evidenced by cheering the Oregon loss, all while ignoring the lost opportunity of a shot at knocking off the #1 team in the country. 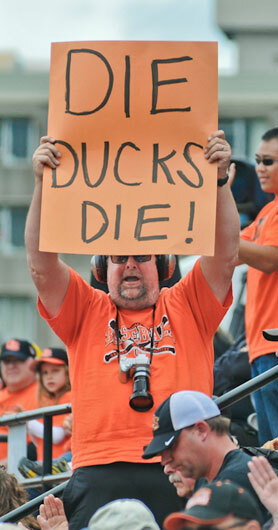 The shortsighted perspective from “Beaver Nation” causes them to lose focus on what it means to be a fan of a team. Ideally, your goal and rooting interest as a fan is to see your team have as much success as possible; specifically, you want your team to win as many games and championships as it can. In college football, the only sport in America where success is determined by factors other than the game itself, the enhancement of a team’s profile is paramount to its success. That success is determined not only by a team’s achievements during the season, but what they have done historically. Additionally, what those in their conference and on their schedule have done historically is just as significant. A single season’s achievements aren’t enough to gain the benefit of the doubt. Oregon fans realize the necessity of democratizing success in college football, that the attainments of those around them is just as vital to their success as their own achievements. Oregon State fans fail to grasp that by rooting for an Oregon team to fail so that a Notre Dame or Alabama might prosper, isn’t just rooting against your rival; it’s rooting against your own chances at success. It’s maintaining the status quo, squabbling over a fiefdom while ignoring the bigger picture in the college football universe. Ensuring that the existing power structure is never threatened loses sight of the big picture. Wishing for victory over a rival is good. Wishing for the demise of a rival outside of the upper echelons of college football’s historical hierarchy is nothing more than crabs in a bucket. As long as Oregon State fans continue to wish ill on Oregon’s program in its entirety, and by proxy, wish ill on its own, it exists no longer as a rival, but as an enemy. Saturday’s game is not only about possession of the state, it’s about fighting a system that has done everything it can to repress parity in college football. 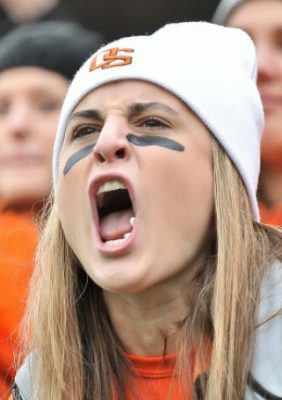 It’s a system that Beaver fans continue to perpetuate, and until they understand that dynamic, they will be nothing more than another part of that repression. To beat Oregon State is to notch another victory against the existing structure, and it’s a victory I won’t feel the least bit guilty about.